On May 6 in Stratford, Ontario, Stratford Central Secondary School will host an arts gala evening to launch the school’s new Arts Hall of Fame and celebrate its first inductee, James Crerar Reaney, who went to high school there over 60 years ago. Over the years, James Reaney maintained ties with the school and led workshops there for two of his plays, King Whistle and Alice Through the Looking Glass. May 6, 7, and 8, in Strathroy, Ontario, Evelyn D’Oria and the students of Strathroy District Collegiate Institute will present James Reaney’s adaptation of Alice Through the Looking Glass. There will be three evening performances of the play starting at 7:00 pm, and a matinee on Saturday at 2:00 pm. 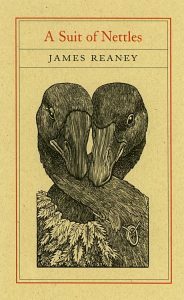 On May 25 in London, Ontario, the new edition of James Reaney’s A Suit of Nettles will be launched at the London Central Library, 7:00 pm. This long poem won the Governor General’s Award for Poetry in 1958. The new edition, published by The Porcupine’s Quill, is charmingly illustrated with woodcuts by Jim Westergard.